When Cornelius Allen gives his daughter Clarissa's hand in marriage, he presents her with a wedding gift: the young slave she grew up with, Sarah. Sarah is also Allen's daughter and Clarissa's sister, a product of his longtime relationship with his house slave, Emmeline. When Clarissa's husband suspects that their newborn son is illegitimate, Clarissa and Sarah are sent back to her parents, Cornelius and Theodora, in shame, setting in motion a series of events that will destroy this once powerful family. Told through alternating viewpoints of Sarah and Theodora Allen, Cornelius' wife, The Wedding Gift is a stunning novel that shows where the complicated and compelling bonds and relationships between women explored in novels like The Help and The Secret Life of Bees began. 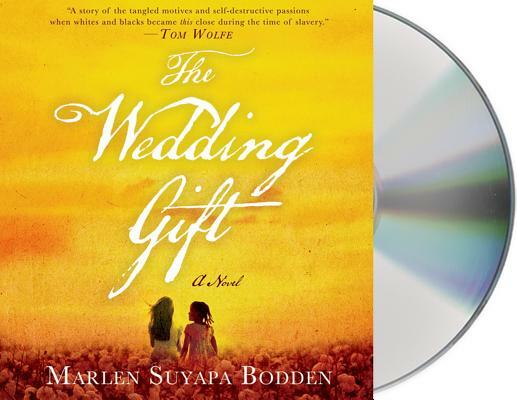 Marlen Suyapa Bodden's novel is an intimate portrait of slavery and the 19th century South that shows where this particular American story and dynamic all started and will leave listeners breathless. MARLEN SUYAPA BODDEN is a lawyer at The Legal Aid Society in New York City, the nation’s oldest and largest law firm for the poor. She drew on her knowledge of modern and historical slavery, human trafficking, and human rights abuses to write The Wedding Gift, her first novel. Marlen is a graduate of New York University School of Law and Tufts University. In 2012, the University of Rhode Island awarded Marlen an honorary Doctor of Laws degree. Jenna Lamia is the acclaimed narrator of Mary E. Pearson's The Adoration of Jenna Fox, which won a YALSA Amazing Audiobooks for Young Adults award, and Carol Lynch Williams's The Chosen One, for which Jenna received the 2010 solo narration (female) Audie Award. Lamia made her Broadway debut in 1988 in Ah, Wilderness, and she's also appeared off-Broadway in The Glory Of Living, directed by Philip Seymour Hoffman. Her other acting credits include appearances on Oz, Law & Order: SVU, The Jury, and NYPD Blue. She's also appeared in the films The Fighter, The Box, and Something's Wrong in Kansas.She attended Amherst College, New York University, and the Sorbonne in Paris. January Lavoie has narrated the Sweet Valley Confidential series for Macmillan Audio, as well as The Snow Angel by Glenn Beck and Dreams of the Dead by Perri O’Shaughnessy. “Bodden wraps some of the most complex issues facing the world today, slavery, racism, misogyny, and violence in an unflinching tall tale about an American family that is black and white. This compelling and fierce historical novel, where the slave master gives his white daughter his black daughter as a wedding gift, is set in the big house of a wealthy plantation before the Civil War and is based on a court case from the 1840s in Talladega, Alabama.” —Henry Louis Gates, Jr.